I am a huge fan of garlic and frequently come up with meal ideas centered around that main ingredient. Sometimes that means simple sauteed greens. Other times it is a more complex dish with lots of different layers of flavor. This meal was of the latter type and I LOVED how these flavors all came together. It is sweet, savory, smokey, and just a tiny bit spicy all at once.This is an enjoy-with-a-glass-of-wine kind of meal! Heat the water and salt to a boil over high heat. Once boiling, slowly add the polenta. Reduce the heat to medium, add the margarine and liquid smoke, and stir continuously until very thick. Pour mixture into an 8x8 inch (or similar size) pan lined with parchment paper. Let cool completely (can be refrigerated to speed this up). Once cool, remove from the pan by lifting the parchment paper. Cut into roughly 2-inch squares. Lightly coat (or spray) a skillet or griddle with olive oil. Heat over medium heat then fry the polenta squares until lightly browned on each side. Heat the olive oil in a large skillet over medium heat. Add the garlic and onion and saute for several minutes- until the onions begin to brown. Add zucchini (courgette), eggplant (aubergine), and bell peppers. Cook until they begin to soften and the zucchini is lightly browned in places. Add chopped tomatoes and dried herbs and cook for a few minutes more. Season to taste with salt and pepper and stir in the tempeh sausage. Heat 1 tbsp olive oil in a skillet over medium heat. Add the tempeh and saute until it begins to brown. Add the garlic and remaining ingredients, except the Bragg's aminos. Saute until the garlic is lightly brown. Sprinkle the Bragg's aminos over the tempeh (it is VERY salty, so start with less and add more if necessary!). Cook for a minute or two more then remove from heat. 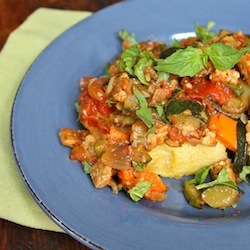 To serve: Place two squares of polenta on a plate then top with ratatouille/sausage mixture. Sprinkle fresh basil over the top. I'm a huge garlic fan too, so don't feel alone! Haha, best thing ever!